Anyone listening to Auckland's Fleet FM at some point last week may have had the pleasure of hearing me say something along the lines of "okay I'm going to play an great song by Crystal Stilts, which is either called 'The Sinking' or 'Shattered Shine', I'm not really sure." Then later on I say I'm about to play 'Backwards' by The Motifs, only to play 'Yours & Mine' instead. Then do it all over again when I played Henry Dress' 'Zero Zero Zero' instead of 'Hey Allison'. In the space of one radio show I was foiled by three different mysterious records. My definition of a mysterious record is one whereby it's impossible, or at least difficult, to know side a from side b. 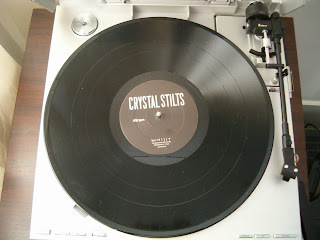 The Crystal Stilts has three tracks on each side and there's nothing on the label to tell you which side is which. So I get to know one side as the side with writing on it, and the other as the one with the Woodsist logo - but I've no clue how that relates to the track. Okay so the sides are etched on that bit inbetween the label and the vinyl where hip labels like to leave little messages, but it took me a while to notice that. The Motif's record has completely blank labels and no etching at all, so they only way to tell side a from b is to count the tracks - 12 on side a, and 11 on b - but who can be bothered counting that high. 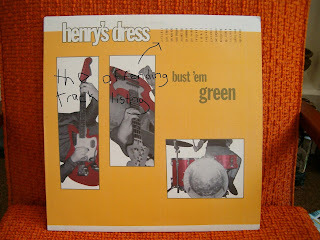 But Henry Dress' lone LP 'Bust 'Em Green' is the most confusing of all. On side has 'Stop' on it and the other 'Go' - and despite what you may think the album starts with 'Stop'. But then the track listing is listed in just one big block of text with nothing to distuigish tracks, let along sides. So unless you have some prior knowledge of the songs (from mix tapes and the like) it's truly impossible to work out which side is which. This is probably also a good time to point out the Crystal Stilts EP and the Motifs LP are two of the best records I've heard this year. The Motifs LP compiles some older singles they've recentyl released, as well as a bunch of new stuff too. There's only 200 being pressed so, if it hasn't sold out already, get to Knock Yr Socks Off's myspace to order yourself a copy. The Crystal Stilts LP has just been released by Slumberland and is pretty awesome, though I think I still prefer this EP. They keep getting compared to New Zealand bands, mostly just because Hamish Kilgour "discovered" them, but that doesn't mke much sense to me. To me they sound like early Felt, only much more dancable - that's bedroom dancing, not the silly club type. I'd kill (not really) for the Henry's Dress LP. Such a wonderful record, but it goes for ridiculous amounts of money the couple of times I've tried to buy it off eBay. 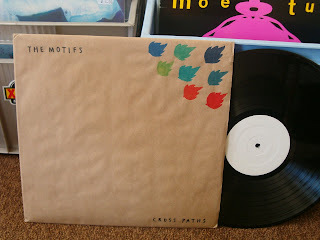 I adore the Motifs LP as well. Luckily I got my hands on that for the normal price! i was lucky enough to find a copy for fairly cheap in a london record shop. or i should say i was lucky enough to have my friend find a copy she let me buy. it's a great listen, and i'm currently loving LPs at 45. If you look really carefully between the last track and the label, where the grooves are cut for the record to spin around endlessly at the end, there's usually some handwritten numbers from the mastering process because the metal masters used to press the vinyl have to be distinguishable in manufacturing. I have to close one eye to read it usually. So, looking at those numbers, it's pretty obvious which side is which... This has never failed me. And Dennis... thanks for the tip that the Henry's Dress LP is valuable...I wouldn't have thunk that this would be one to go up in value. I think I might only have bought it because Mike Schulman in Mod Lang records in Berkeley when I was in college said something like, "Have you heard Henry's Dress? It's so ace! You gotta buy it."